Last Saturday a Special Indian Court in Bangalore gave manifest evidence to show that India truly deserves the accolade of being the world’s most populace democracy where the rule of law reigns supreme; and that each and every one without exception — no matter the power they wield, the riches they command and the political position they hold — is equal before the majesty of the law. In a land not unknown for its rampant corruption, the silver line in India’s black cloud of flagrant political abuse, has been the independence of its judges; and when Justice John Michael Cunha delivered his 896-page judgment, holding Tamil Nadu Chief Minister Jayaram Jayalalithaa guilty of graft and jailed her for four years, he was following a judicial tradition that the rule of law must be upheld regardless of the status of the prisoner in the dock. As a result the prima donna of Indian politics and reigning queen of Tamil Nadu whose party swept the state at the general elections barely four months ago, has been brought down to her knees to sweep her own cell floor. The crash of this icon, invested with divinity, haloed with invincibility and almost brushed with immortality, erected upon the solid base of mass popular support has been brought about not by the will of the people, for her people love her, not by the efforts of the Tamil Nadu opposition parties, for they are but insignificant sprats in a sea dominated by her killer-whale frame but initially by the Indian government’s own investigative body empowered since 1964 to probe governmental corruption in high places; and finally by the sacrosanct respect India, for all its faults, for all its many ills, pays to her impartial quality of justice which falls, like the rains from the sky, equally upon all. 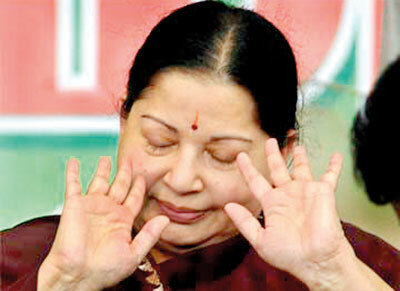 The investigations into Jayalalithaa’s affairs began in 1995 when she was chief minister of Tamil Nadu. It was initiated by the Directorate of Vigilance and Anti-Corruption which discovered that the assets owned by Jayalalithaa were disproportionate to her income. This was the crux of the case filed against her by the Directorate and it was on this that she was convicted. Apart from this, during that time she had spent over Indian Rs. 80 million for her foster son’s wedding, had over 12,000 saris in her cupboards, over 60 pounds of gold in her safe and had built three plush residences for herself with one renovated at a cost of Indian Rs. 60 million. If that were not enough she had also acquired a chemical company in Chennai, 1000 acres of land in Tirunelveli and an agro farm in addition to other properties. No doubt India, for all its checks and balances and legal framework to prevent corruption, still has enough loops in its system for a determined, unscrupulous politician to smuggle through. That is to be pitied. But what must be admired is that in her institutions, created and empowered to crackdown on corruption, she still has determined people who stand true to the declared purpose and aims of those institutions they serve. And with successive governments daring not to interfere in the fine workings of the judiciary, India is blessed to be adorned with a judiciary that does not exist only as an ornamental pendent on the golden chain of democracy but one that breathes robustly to uphold the sanctified principles of justice whatever the cost, whoever the adversary. It is the combination of both the investigative arm and the judicial branch that finally turned the tables on Jayalalithaa’s tenure of graft and made it possible for nemesis to catch up with her after shadowing her for twenty years. Like a fish smells rotten from head to tail, the Lankan body politic is ridden with corruption and stinks. Once when even an allegation of possible corruption was enough to make a minister of government immediately tender his resignation and quit office, following the adage that Caesar’s wife must not only be suspected but be above suspicion, today the tendrils of corruption have spread and acts of graft which would have left a nation aghast are now accepted as the norm; and shock no more a people who, impotent in the face of its despicable growth to stem and eradicate the pestilence, have but to grin and bear its presence. Graft Rules OK, seems to be the motto of our times. But with society looking askance in apathetic air, practitioners of the crude art of graft have become bolder and have even begun to flaunt their ill gotten gains in the face of the toiling masses. Cocooned in safety fortified with election victories and drunk with power to the point of intoxication where they couldn’t care less what the people thought, they make no attempt to conceal their shame but parade it before the public gaze confident they are beyond the long arm of the law and blurred, nay, invisible in the eyes of the otherwise omniscient Tax Department. How do you explain the meteoric rise of people from unknown walks of life who, when they first appeared in the public eye and sought the people’s vote in order to do public service, did not even have a push cycle to call their own? Today, after joining the privileged assembly of Lanka’s chosen seed, their service record to the people show not what they have done to uplift the masses in keeping with their public election promises but how they have assiduously honoured the secret vows they had made to themselves to further their own fortunes. Two government institutions exist to investigate governmental corruption. One is the Bribery Commission and the other is the Inland Revenue Department. The Bribery Commission, though it moves swiftly to inquire and punish the petty official who seeks a petty bribe, is conspicuously silent and inert when it comes to inquiring against politicians. That leaves the Tax Department, known for his merciless inquiries into a professional doctor or a lawyer’s income. But when it comes to politicians they are ominously inactive and do not possess the same enthusiasm they show when determining the taxable income of a private individual without political pull. In the absence of an enforceable code of conduct for ministers in Lanka, it is possible that ministers maybe able to have their own businesses on the side. But isn’t it only right that they disclose what these businesses are as directors of even small privately owned companies are required to do by law so that shareholders can determine whether there is any conflict of interest? More so for a minister, who as the people’s representative owes a fiduciary duty to the people to name what their other businesses are? But though the people may not have a legal right to demand disclosure the Inland Revenue Department certainly has. They can legally demand from the members concerned to disclose not only their businesses but the accounts of their companies, especially since these businesses seem to be generating enormous profits to enable the owners to enjoy a luxurious life style beyond their visible means. There may be Jayalallithaas amongst us. But there is certainly no Directorate of Vigilance and Anti-Corruption in our midst. If the Government is serious about cracking down on corruption it should make haste to establish one. A peace crimes commission to inquire into allegations of governmental corruption will be welcomed by the national community, provided it has the teeth to bite and the backbone to defy pressure. If diamonds are a girl’s best friend then free foreign travel trinkets come a close second to captivate a woman’s diffident heart. Or so it seemed for Rosy Senanayake this week until a miraculous eleventh hour stroke of Providence changed her mind and saved her from public censure. Was this, I wondered, the same Rosy Senanayake, the former Mrs. World and now UNP’s First Lady of Glamour, who in the past has criticised government MPs for embarking on meaningless foreign trips and pontificated on the criminal squander of public money spent on such junkets which bring no tangible benefits to the country other than to themselves? Was this the same Rosy Senanayake, who now, when she happened to be the fortunate recipient of Government’s largesse funded by the public coffers, saw nothing wrong in engaging in a bit of squander herself of the people’s money? My fears, which remained a whole week till Friday, proved to be unfounded. For before the rosy hue that lies permanently settled upon her powdered cheeks turned to soot and shadows fell upon her face to blight her fair complexion, she emerged from darkness to light with the realisation that maybe she has been singled out for this singular honour over and above the host of Government MPs who would have even gladly changed their religion to enjoy a free first class holiday abroad, not because of her religious faith but solely due to her professed political beliefs. Wisely, she declined the offer in the nick of time. She had finally realised that though green in politics, green in environment, and still, despite the passage of years, evergreen in appearance, she was not green in judgment and was not prepared to become the blue eyed belle of the presidential nade. Rosy has fathomed more than her elected colleagues, the importance of UNP members to be seen making personal sacrifices for the sake of the party. Just when the UNP is showing signs of reforming itself and presenting a new image as a solid, above board, principled opposition party beholden to none, a reputation that befits the upright image of a genuine opposition party requesting the people’s mandate to form the next government, it would be irresponsible for any member to throw the spanner inthe works by accepting governmental freebies and casting the UNP as a party in league with the Government. And that is what the party’s Chief Whip John Amaratunga is doing, and doing for the second time without any repentance. After praying on public money in a historic Jerusalem grotto when he joined the Presidential delegation as a political pilgrim in January, he accepted the offer to kiss the papal hand with open arms. He is old, he is incorrigible, once a sturdy UNP pillar now an unmourned ruin, a man beyond the pale; who, in his winter, has balanced his hat on the fence and gone over the abyss searching for another glass of summer sunshine. The less said of this dried up political prune, the better it is. The response of ‘ever ready’ John was only to be expected. But not so is the reaction of the UNP leadership which has sunk into silence so far. If it does not crack the whip against its own Chief Whip it will fail in its duty to ensure order and discipline in the party. Standing on the threshold of presidential and general elections which may turn the course of Lanka’s history, the UNP leadership must view with concern and all seriousness this ready willingness of some of its party members to accept personal favors from the ruling party. Iron discipline must be instilled. Hard choices must be made. John Amaratunga must be asked to go, the moment he returns from his Vatican freebie. How can the Chief Whip of any party be able to maintain any discipline amongst the members if he is the chief transgressor? If the UNP does not instil discipline amongst its party members and insist that a rule applies to all equally and cannot be violated even on religious grounds, then it will be far easier for an elephant to go through the eye of a needle than for Ranil Wickremesinghe to be ensconced in the President’s House as President. As for Rosy Senanayake, all credit to her for making the correct decision and for not placing the UNP in an embarrassing position which, given the wrong vibes it may otherwise have sent to the electorate, might have condemned the UNP to another six-year exile East of Eden. Had it not been for her last minute change of heart, the question whether the pole-vaulting event has already begun even before the election games have started would have been dancing on people’s lips today to the heady beat of UPFA’s belting drum. No doubt divine revelation made Rosy see the light on Thursday when she chanced to imagine herself at the Apostolic Palace, gazing at the highest section of the Sistine Chapel’s ceiling and admiring Michelangelo’s paintings from the Book of Genesis, when realisation dawned and she was struck by what every Christian knows: The world’s suffering began and paradise turned sour when Eve gave into temptation and took a freebie bite off the forbidden fruit. What price does a country’s integrity command? The Sajin Vass scandal: Will they say Nonis slapped himself?